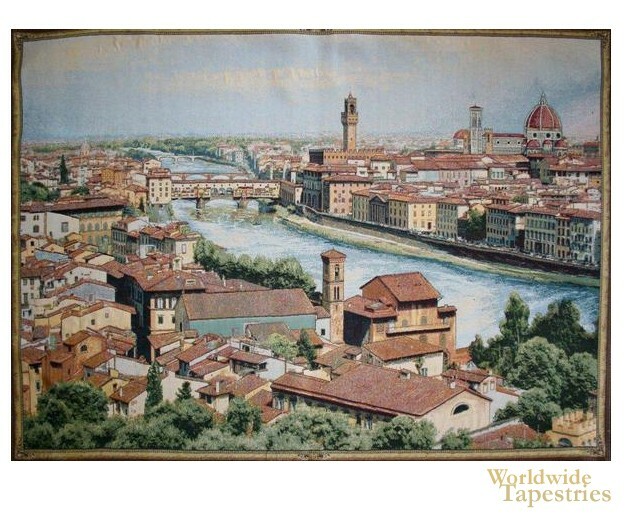 View of Florence and the Arno tapestry shows a view of the famous city and the Arno river. Here se wee the traditional architecture which preside along the river. Florence is the capital of Tuscany region and is famous for its architectural beauty and culture. It is known as the birthplace of the Renaissance since the Roman times, thanks to the help of the Medici family. In the very distance is the Apennine mountains. The View of Florence and the Arno tapestry is backed with a lining and a tunnel for easy hanging. Note: tapestry rods and tassels, where pictured, are not included in the price.